This summer at Esri’s User Conference in San Diego, California, the City of Oshkosh and Houseal Lavigne Associates were recognized for their work with a Special Achievement in GIS Award. In 2017, Oshkosh’s largest employer, Oshkosh Corporation, began engaging communities across the nation in search for a new global headquarters. Oshkosh Corp’s recent success with a multi-billion dollar contract for manufacturing the military’s Humvee replacement was motivating them to build a state-of-the-art global headquarters to attract the workforce they needed. As one of the smallest cities with a Fortune 500 Company, City officials knew it would be difficult to retain them. Earlier that same year Oshkosh Corporation rejected a concept for a new downtown waterfront campus. Once Oshkosh Corp rejected the Downtown site, they published a list of their desired site criteria, including: more than 30 acres, interstate access, financially feasible, a “WOW!” World Class location, shovel ready, and able to attract a workforce. Seeking to retain Oshkosh Corp and their jobs, City staff performed a site availability assessment in Esri’s ArcGIS and found 18 sites in the community that met some of Oshkosh Corp’s criteria. In performing the analysis they discovered the City’s Lakeshore Golf Course met all Oshkosh Corp’s site criteria. Before the City could offer a portion of its waterfront golf course, staff had to convince the public and City Council that selling part of the golf course was the right decision for the community. The City hired Houseal Lavigne Associates to develop a program and visualize what the campus could look like and help with a community dialogue to win public support for the project, and ultimately convince Oshkosh Corporation to stay in the community. With only a month to submit a proposal, Houseal Lavigne Associates was asked to develop a plan, program, and renderings. The plan had to incorporate dramatic views of their main building, public recreational amenities, a riverwalk and trails, access to Interstate 41, and opportunities for expansion. Utilizing Esri’s CityEngine, they produced illustrations and a webscene that were critical in helping the public visualize the potential for the concept and ultimately win support to sell part of the golf course for the new global HQ. In November Oshkosh Corp’s Board of Directors accepted the City’s proposal to purchase the golf course and construct their new HQ in Oshkosh. Once Oshkosh Corp rejected the Downtown site, they published a list of their desired site criteria, including: more than 30 acres, interstate access, financially feasible, a “WOW!” World Class location, shovel ready, and able to attract a workforce. Desktop GIS was used by City staff to find sites within the City fitting their search criteria. Based on the queries performed in ArcMap, only the Lakeshore Golf Course met the requirements of Oshkosh Corporation. Visualizing the proposed development concept in 3D was critical to winning community support. Esri’s CityEngine was used to help visualize the new Corporate Headquarters, along with the future public parkland surrounding the campus, a new Riverwalk, new piers and boat slips, and new commercial development along the frontage road. CityEngine was also used to generate site data, including square footage of the future uses, parking requirements and supply, and linear feet of new roads and sidewalks. The new HQ is currently under construction, with occupancy targeted for October 2019. A website for the project has been created (https://oshkoshhq.com) where visitors can track its progress, take a virtual tour, and even view webcam images of the construction. Each year, the Illinois Chapter of the American Planning Association recognizes the best in planning across Illinois with its annual awards program. This year we are proud to announce that our Envision Oak Park Comprehensive Plan has earned a 2017 APA IL Award for Community Outreach. 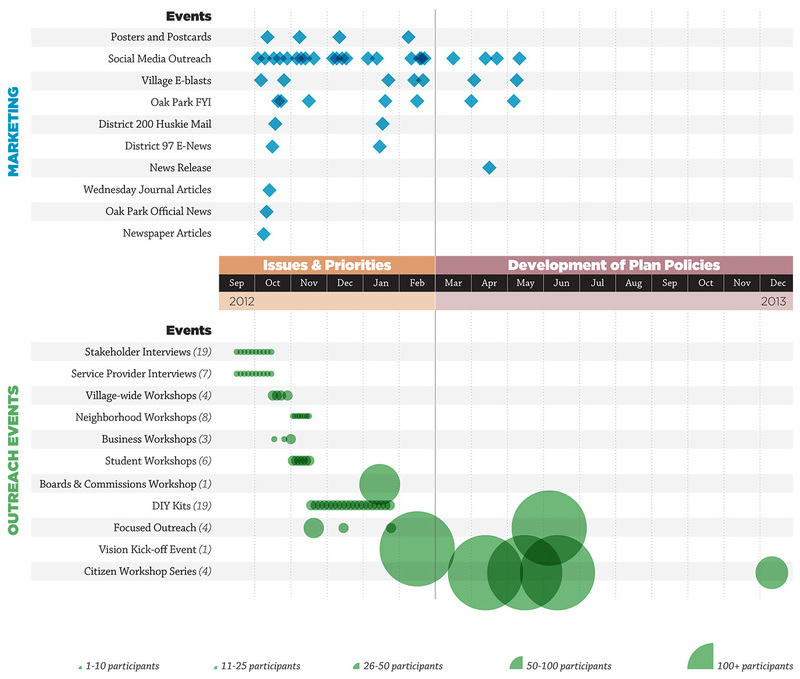 The Envision Oak Park public outreach process was comprehensive and thorough in its scope. From the outset, the goal of the Village government, the Comprehensive Plan Advisory Committee, and our planning team was to engage citizens in order to draft a vision and series of recommendations that are specifically reflective of local goals and objectives. We are honored to receive such a prestigious award and are dedicated to continuing our forward thinking approach as we look to the future of planning. We are always striving to understand the needs of communities we work with and utilize creative and innovative ways to capture data from community stakeholders. In addition to many face-to-face meetings and traditional workshops, our community engagement in Oak Park included the utilization of our revolutionary web-based community outreach platform map.social. Houseal Lavigne Associates created map.social (formerly sMap) to easily and effectively connect with all members of the community. More details about the Envision Oak Park can be found here. We are thrilled to be featured on ESRI’s Blog and glad they picked up our work in Oshkosh on the Imagine Oshkosh Center City Master Plan. Matt Ball’s article effectively captures how Houseal Lavigne used CityEngine’s procedural modeling and 3D visualization to spur the imagination and trigger successful economic development. 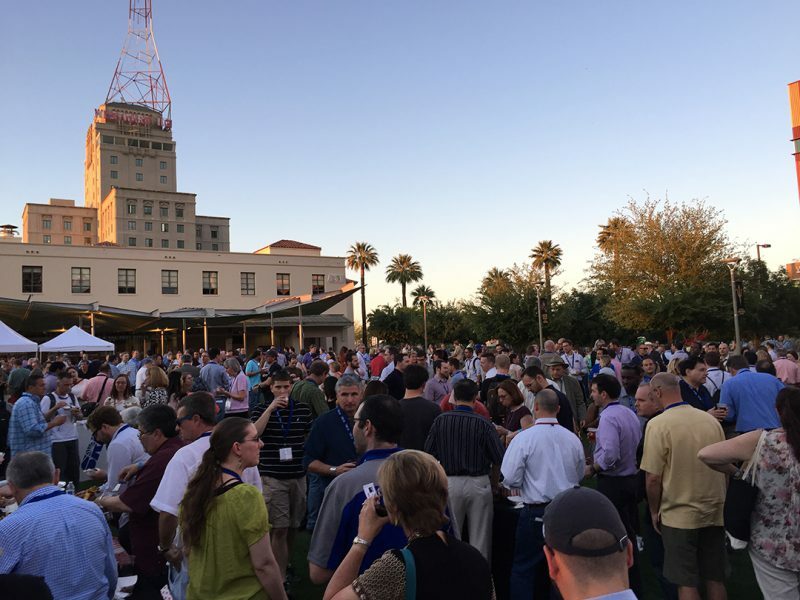 Houseal Lavigne Associates had a great time at the 2016 APA National Conference in Phoenix this year! Seeing old friends and meeting many new people was a highlight of the event, especially mingling outside in the great weather at the Civic Space Park. Welcome Reception at Civic Space Park including food trucks, live music, beautiful weather, and more food trucks. We hope you all enjoyed yourselves as well, and we hope you enjoyed some of our presentations throughout the event. Over four days we discussed all kinds of current topics related to planning, including urban agriculture, Geodesign, and community-authored plans. If you were unable to attend our session, meet us in person, or come to the exhibit hall to check out our sMap App in action, please don’t hesitate to get in touch! We look forward to seeing you in San Diego at the ESRI User Conference at the end of June as we unveil new ways that our partnership with ESRI is changing how professionals and communities are using local plans. We will also be at the Illinois APA Conference in Chicago in September, and the 2017 APA National Conference in New York next year! It’s time for the 2016 APA National Conference, and another opportunity for Houseal Lavigne Associates to share our experiences and knowledge with planning professionals from around the world! We’re excited to be heading to Phoenix for the 2016 APA National Conference on April 2-5. We look forward to catching up with old friends and meeting new faces at the Houseal Lavigne booth in the exhibit hall. Also, please visit our sMap booth and learn more about our new partnership with ESRI! You can use sMap to learn more about what to do in Phoenix by clicking here. sMap is being used across the globe by communities, agencies, and consultants for a variety of planning and outreach initiatives. All of the information on sMap will be available at the booth. The community-authored plan is an ideal toward which many communities strive. But how do you balance such public involvement with the technical and statutory requirements of local planning? This session introduces key considerations and strategies to maximize citizen resources. Planners and city managers cross paths all the time. Some of them even find themselves doing a little bit of both. MPA vs. MUP. ICMA and APA. We will tackle what skills from both professions help do what’s effective. Considering a career as a planning consultant? 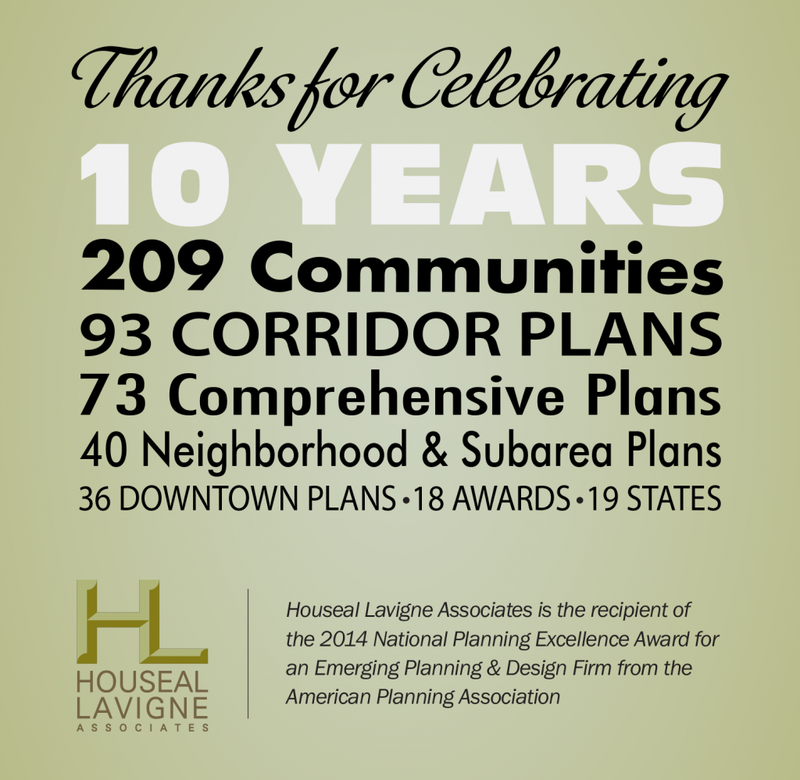 In 2014, Houseal Lavigne Associates received APA’s Planning Excellence Award for an Emerging Planning and Design Firm. Learn what worked and what didn’t in launching a firm during challenging economic times in the late 2000’s. Discover how geodesign, a new design approach, is allowing planning and design professionals to anticipate future trends and propose planning solutions. Learn how it also is helping communities and decision makers make the wisest, most well-informed choices possible. Many believe urban agriculture can yield wide-ranging environmental, health, and economic benefits. However, some are wondering whether urban agriculture can realize these lofty goals. This session will discuss the tools available to promote, or regulate, sometimes controversial agricultural activities in an urban environment. Can municipal finance metrics inform urban planning? Financial planning, budgeting, land use planning, and economic development programming are all closely interrelated. Learn how to calculate your own financial indicators and use them to inform local government planning efforts. In this session of 7-minute fast and funny presentations, Dan will be presenting a humorous and personal perspective of balancing years of experience with a continually evolving work place. Cecilia will touch on how little people can do big things in their cities. In this session of 7-minute fast and funny presentations, Devin will critically evaluate a severely-flawed cityscape play mat from IKEA. In this session of 7-minute fast and funny presentations, Nik will be providing a planner’s perspective on some common misconceptions we hear when first kicking off a project that either divert attention away from the real planning issues, or are just plain wrong. Prepare for the AICP exam with this three-hour workshop. It starts with a 30-minute tutorial on the application process, followed by an overview of the six sections of the exam. Fifteen minutes at the end of the workshop are set aside for Q & A. Imagine Flint – A Master Plan for a Sustainable Flint has received 2 prestigious planning awards: the Daniel Burnham Award for a Comprehensive Plan by the Michigan Chapter of the American Planning Association; and, the Macinac Prize by the Michigan Chapter of the Congress for New Urbanism. Comments from Juror Leslie Creane, AICP are below. Additional information about Imagine Flint, including additional images can be found on our portfolio page. The Master Plan for Flint is a vision – in more ways than one. The document is a graphic work of art that gives enough “air” around each subtopic to keep the reader engaged. Each chapter keeps the same 7 items up front: Imagine, Social Equity + Sustainability, Quality of Life, Youth, Reshaping the Economy, Adapting to Change, and Civic Life. The use of colored circles to code each Objective, showing which principles have been considered is brilliant. It is the equivalent to a restaurant rating and, at first blush, gives the reader an idea of which Objective serves the widest need. Much of the focus of the Flint Master Plan is on shrinking the geography of infrastructure investment. The concentration of city amenities and services is a crucial first step. Although regulating plans are not a part of this document, the Flint Plan does and exceptional job of laying out the principles that create great places. There is discussion of the residential, commercial and public realm aspects of neighborhoods. The traffic calming section shows an understanding of the street/sidewalk areas as a dedicated public realm. The section on ‘commercial corridors’ as linear connections is followed by the section on the ‘downtown’, which is clearly shown as a neighborhood. The character descriptions of each type of area are clear and articulate New Urbanist principles without the jargon. The innovative use of a “Land Use Wheel” takes the linear New Urbanist transect and creates a circular continuum. There are nuances to this wheel that deserve further study. Each chapter has an aesthetically pleasing matrix that lists strategies, time frames for achievement, public cost estimate, lead agency and “progress indicators”. This is the most innovative and well executed Master Plan I have seen. The level of public input, the consistency of message, the graphics, the commitment to each aspect covered is truly inspiring. The team(s) that created this Plan should be incredibly proud. They have created a cutting edge document that others are sure to emulate. Never before has there been such a need for planning and design professionals to anticipate future trends, propose solutions and help communities and decision makers make the wisest, most well-informed choices possible. A new design approach — one rooted in the history of design practice and enabled by rapid advances in technology — has emerged to meet that need. This approach, called geodesign, provides the framework and tools needed to explore issues from a transdisciplinary perspective and to resolve conflicts between differing points of view. Join Houseal Lavigne Associates, PlaceWorks and Esri as they explore how geodesign and GIS technologies can increase your project success, highlighting the issues through several exciting case studies. Devin Lavigne, principal at Houseal Lavigne Associates, will provide insight into their approach to integrating procedural modeling into their design workflow, adding efficiency to their 3D production pipeline. Robert Kain, GIS manager at PlaceWorks, will share how their adoption of Web GIS and GeoPlanner has enabled them to make location-driven decisions on many of the firm’s land use planning projects. Brooks Patrick, geodesign account executive at Esri, will provide an overview of geodesign and discuss how Esri’s ArcGIS platform supports geodesign implementation. We look forward to seeing everyone in Seattle for the 2015 APA National Conference April 18-21. Be sure to stop by the exhibit hall to see the Houseal Lavigne Associates booth and chat with our Team. We are always excited to catch up with old friends and meet new faces. Also be sure to visit the sMap booth. sMap is now available for individual licensing and is being used across the country by communities, agencies, and consultants for a variety of planning, economic development, and outreach initiatives. Drop by the both to get all the info. Zoning is where the rubber hits the road between planning and implementation, but the path isn’t always smooth. How can zoning be used to implement planning most effectively? Examples from five communities in four states demonstrate various levels of intervention, from minor tweaks to complete transformation. When planners make mistakes in documents, it’s often under public scrutiny that can derail otherwise sound planning. This session includes a humorous review of common pitfalls from typical typos to layout mishaps and provides tips for avoiding those mistakes. Prepare for the AICP exam with this four-hour workshop. It starts with a 30-minute tutorial on the application process, followed by an overview of the six sections of the exam. Fifteen minutes at the end of the workshop are set aside for Q & A. Whether by choice or consequence, starting a firm or venturing out on your own can be frightening. Highlighting last year’s award-winning Emerging Planning and Design Firm, this session will show what worked and what didn’t and the strategies, tools, software, and techniques utilized to grow during one of the nation’s worst economic climates. We want to thank everyone who was able to come out and celebrate the firm’s 10 year anniversary earlier this month. Having officially turned 10 on November 8th, 2014, it was great to catch up with old friends and new partners that have helped shape a decade of work for Houseal Lavigne Associates. The celebration was held at Randolph Tavern in Downtown Chicago and included clients, consulting firms and organizations, and friends of the Firm, all having a chance to eat, drink, and share good conversation. We are so thankful to be part of such a welcoming and diverse professional community! The story of Flint, as made infamous in Michael Moore’s Roger & Me, has been that of decline and hopelessness. However, the Imagine Flint Master Plan is beginning to change all this by providing the community with a single, united vision and the guidance needed to help transform Flint into a vibrant sustainable community. People and organizations are pledging their help. Institutions are investing. Businesses are expanding. Though only adopted in October 2013, the Master Plan has yielded tangible results. The housing conditions data produced through the process has helped the City secure more $24 million in grants for demolition, neighborhood planning, and redevelopment efforts. In January 2015, the U.S. Department of Housing and Urban Development (HUD) Secretary Julián Castro announced seven new Choice Neighborhoods Planning Grant awards, including $500,000 to the City of Flint. One of 51 applicants, the City of Flint will use the grant, in partnership with the Flint Housing Commission, to create a plan to address the historic challenges of poverty and crime impacting the Atherton East public housing development and surrounding areas. “This new grant will enable us to work with residents, partners and the Flint Housing Commission to develop a neighborhood transformation plan. This is another step forward in implementing the Imagine Flint Master Plan and demonstrating that we can create neighborhoods that are safe, vibrant, and inclusive in every part of the city.